The Minister for War shared his mistress with a Russian spy! Criminals and cabinet ministers cavorted with teenage prostitutes in the Astor’s stately home (or more correctly, their swimming pool)! The osteopath to the stars was a pimp! I can remember how fascinated we all were, as the papers dribbled out the prurient facts of what has become known as the Profumo Affair. According to this book, nearly all of the published details were malicious fantasies dreamt up and circulated by jealous political rivals, corrupt police officers or the press itself. In retelling the story, Richard Davenport-Hines is also describing that strangely foreign country that is the relatively recent past. We certainly did things differently there. In those unliberated days of the early nineteen sixties, privacy and propriety were all important. Men were supposed to be heterosexual and monogamous, women inexperienced and children ignorant. The respectable British middle classes lived by or at least paid lip service (hypocrisy being the dominant feature of the period) to traditionally Puritan principles. But there was another parallel world in which posh and/or rich people allowed themselves the sexual freedom that, half a century on, everyone takes for granted. 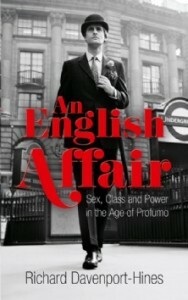 In 1963 the whole structure of British society tottered when the details of the Profumo affair became public knowledge. The story fed to newspaper readers was that Christine Keeler, a prostitute, had been procured by her pimp, an osteopath called Stephen Ward, for the Minister for War, John Profumo, at Cliveden. Keeler was also sleeping with a Soviet naval attaché, so if the story were true there would be grave implications for national security. Profumo, not yet having confessed to his film-star wife, made a personal statement to the House of Commons in which he denied having sexual relations with Keeler. When this was exposed as a lie he resigned. Davenport-Hines demonstrates that almost none of these previously accepted details is accurate, and that almost everyone involved, however tangentially, was a liar, hypocrite, fool or rogue. This includes the police, who ‘amassed their rickety evidence by exploiting antipathies’, the notorious slum-landlord, Rachman, Prime Minister Harold Macmillan, members of his cabinet, several newspaper editors and proprietors, even such revered figures as the senior judge Lord Denning, whose report on the Profumo affair was a disgraceful investigation, ‘awash with the spite of a lascivious, conceited old man’. In upholding ‘the primacy of cheap suspicions’ it inaugurated a period when newspapers seemed free to hoax, hound and humiliate any defenceless victim. Many people have written about the Profumo affair, about Christine Keeler and Mandy Rice Davies, the wretched Stephen Ward and the Astors at Cliveden, but this has to be the most enthralling account. I seldom read non-fiction with the same page-turning eagerness as a novel, but An English Affair proved as exciting as a good thriller. I really couldn’t put it down.